Just because you’re looking to keep things on the lighter side doesn’t mean you have to cut out the things you love – and that includes Ranch. 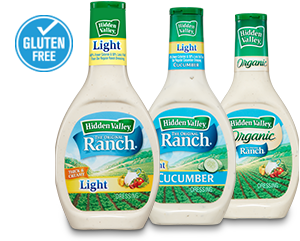 Our Original Ranch® comes in Light and Fat Free varieties so you can still enjoy the thick and creamy taste of Hidden Valley®. These products are gluten free.